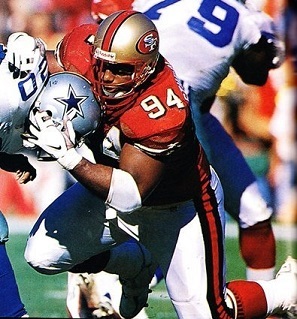 Having lost their two best pass rushers (DE Pierce Holt and DE Tim Harris) to free agency, the 49ers chose Stubblefield in the first round of the 1993 NFL draft (26th overall). With his speed, he proved to be a good fit in the interior of the line and received NFL Defensive Rookie of the Year honors. Stubblefield followed up his outstanding first year with Pro Bowl seasons in 1994 and ’95, seasons in which he recorded 8.5 and 4.5 sacks, respectively, but was coming off a subpar year in 1996. 49ers went 13-3 to finish first in the NFC West with the best record in the conference while leading the NFC in rushing defense (1366 yards). Won NFC Divisional playoff over Minnesota Vikings (38-22). Lost NFC Championship to Green Bay Packers (23-10). Stubblefield moved to the Washington Redskins as a free agent in 1998 and was a disappointment in his three years with the club (7 total sacks) before returning to the 49ers in 2001. In two years back in San Francisco, he revived his career, although Stubblefield was now better against the run than as a pass rusher between the gaps. He finished up with the Oakland Raiders in 2003. In eleven years, Stubblefield recorded 53.5 sacks and was named to the Pro Bowl a total of three times.